At the Dandelion Hideaway – one of our two best places to stay this year! We loved our trip to St George’s Park – home of English football! Jess says: Our tour of St George’s Park in Staffordshire was the clear highlight of my year. Our family are all huge football fans, so it was amazing to see the English Football training ground. It is absolutely massive, with state of the art facilities, and it is home to all 20 national football teams. The U-16 team was there when we visited, and it was cool to know that some of the people we were seeing could possibly play for the senior team in a few years. It was amazing to see the autograph wall (signed by Messi, Suarez, and Gerrard to name a few), the changing rooms, the pitches they play on, and the training centres. It was such an exciting and unique day, and I loved finding out facts that I never would have known otherwise. Robert says: My best day out in 2016 happened to be on my birthday when I went to Thorpe Park with some friends. There were loads of rides to go on and attractions to see as well as plenty of delicious (and unhealthy) snacks to buy. I had never been on a roller coaster with a loop the loop before that day but when I left the park I had been on loads. There were rides that spun you around, a roller-coaster that lasted less than 20 seconds and of course the world famous spinning teacups. I had a fantastic time and it was one of the best days of my year. Sarah writes: We all absolutely loved the retro theme park which is Dreamland in Margate and would recommend a visit for all ages. It is just such a joyful place, as well as being gorgeous to look at! Visiting Dreamland is like going back to the 1950s. There’s a wooden rollercoaster, fantastic bumper cars, a big wheel and much, much more. Even someone as ride-phobic as me had fun, and the children had a blast. But Dreamland is not just the outside rides, there is an old fashioned arcade (fabulous) and roller disco too, as well as affordable food and old favourites such as candy floss and ice-cream. Even better, there’s a frosted fairground during the winter, which makes it the perfect time to visit. Take a trip to the beach afterwards – it’s just 5 minutes walk away – and have yourself a traditional British day out! Brian says: We were lucky enough to take a tour of Big Ben earlier this year, and it was one of the best things we had ever done in London. There was a lot of walking up steps, so you need to relatively fit. However, it was worth it for the breathtaking views. There were two highlights of the tour. The first was walking behind the four huge clock faces. It was a sunny day, which meant that we could see the shadow of the hands on one of the clock faces. It was amazing to see the minute hand moving inch by inch every couple of seconds. You can also see the little pane of glass that is occasionally opened to clear the pigeons off the hands. It would have been a very tight squeeze for Richard Hannay in the 39 Steps. The second was being in the belfry to see the bells in action at the top of the hour. There were four corner bells, and Big Ben itself in the middle. The guide gave us ear plugs but the chimes were still incredible loud. It was amazing to see the hammer striking Big Ben only a few feet away from us and to feel the room vibrate from the bongs. The guide then pointed out the large crack in the casing of Big Ben, as well as the microphone in the rafters which allows the chimes to be heard live on BBC radio. It had been an exhausting walk up the spiral staircase to the top, but it was much quicker going down. We felt exhilarated afterwards, as it had been such a fantastic experience, so I would highly recommend writing to your MP for the chance to take the tour. Jess says: The Muhammad Ali Museum in Louisville, Kentucky is definitely one of the best museums I’ve visited this year. The museum has a perfect mixture of history, inspiration, and interactive exhibits, and is definitely an important place to visit after Ali’s death. I learnt all about what it takes to be a boxer, the racial segregation Ali faced (such as when he was refused entry to a diner after winning his Olympic gold medal), and about the controversy Ali incited. A particular highlight was learning to box in a ring by watching a video, punching a punch bag, and holding onto another bag in order to feel the shock of a punch. It was a fascinating, and enjoyable, and there was definitely something for everyone. I would definitely recommend a visit. Another museum I thought was brilliant was Battle Abbey, located in Battle, East Sussex. It is a little known fact that the 1066 Battle of Hastings actually took place in Battle, not Hastings, and I was really excited to find out more about such a famous battle. The visitor centre had lots to do, including a short film outlining what happened during the Battle, lots of games, an abundance of information, and the opportunity to hold armour. It was very heavy! Although it was raining, we went outside to try the audio tour, which I thought was brilliant. We learnt that 7,000 men had died where we were standing, and learnt all about the tactics used to win the war. It was a fascinating, enthralling trip: perfect for all of us. Robert writes: The National Memorial Arboretum was not my favourite museum, instead it was the one I found most interesting. The Arboretum is home to over 300 memorials, each with its own story. We were taken on a buggy tour of the site and were shown some beautifully crafted memorials and statues dedicated to wonderful groups of people. I found it extremely interesting learning about many people’s fascinating stories and would recommend it to adults and older kids. Brian says: We had a fantastic time in Cornwell over the summer, and we saved the best until last when we visited Tintagel Castle. The location doesn’t seem real, and you can understand why the legendary King Arthur was said to have been born here. The castle ruins are perched on cliffs that jut out into the Atlantic Ocean, with the waves crashing onto the rocks and caves. There are lots of steep steps to climb, some of them on narrow paths that wind round the rocks. After reaching the cliff tops, the views were even more spectacular. I was mesmerised by the scenery, especially by the bit of the coastline that sticks out like a giant dragon’s claw. The statue of King Arthur is also striking – it is partially formed like a ghostly apparition, and complements the windswept peninsula setting. We walked for a couple of hours, stopping for long periods at a time to stare again and again at the mesmerising scenery. Robert writes: Apart from a cold slushy or an long lie in not many things beat a good ride. I’ve been to a number of theme-parks this year including Drayton Manor and Dreamland but my two favourite rides come from Thorpe Park. Swarm is fantastic. After a long journey upwards, when you’re suddenly have second thoughts about going on this ride, you spiral down a large drop followed by a course of twists and loop the loops. It was one of the best roller-coasters I have ever been on and could go on it again and again. Rush was also brilliant. After getting locked into your seats you are swung up and down like a pendulum, sometimes going forwards and sometimes going backwards. Every time you get higher and higher until you are almost lying down, looking at the sky. You then plunge down for another swing until the ride slowly finishes. Many people would look at Rush and think it looks too scary but I highly recommend it. Jess says: We visited lots of beaches during our trip to Cornwall, but the one that stands out the most is Daymer Bay. The bay is situated between the towns Polzeath and Rock, it stands out because of how gorgeous and unusual it is – you are surrounded by green fields. The water was gloriously blue and clear and the sand was soft and fine, making it the nicest and most memorable beach I’ve ever visited in the UK. It was gorgeous! Sarah writes: When it comes to great places to stay, I always enjoy the unusual, and this year, glamping at the Dandelion Hideaway topped the bill for me. I am not an enthusiastic camper – the only way to get me under canvas was to add a bit of glamour to the whole concept – and I found it wonderful. That’s not to say that I’d do it again like a shot, but I am delighted to have experienced it. The Dandelion Hideaway, of course, is not just any glamping. It’s top notch. We actually stayed in a little house with running water, but it gave me some idea about going back to nature. I found it incredible how dark it became when the sun went down, and how little light the candles actually gave us. It was also very cold at night and we needed all our duvets and blankets! I loved experiencing the silence of being somewhere without a TV or computer (and little wi fi!) and the children really enjoyed all the space outside, as well as collecting eggs from the henhouse and meeting all the goats. It really was an incredibly special place and one I won’t forget. Read more about our glamping trip and watch Robert’s video! Robert says: I loved going to Potters Resort as there was so much to do. There was a large selection of sports to try including badminton, squash, tennis and golf as well as quizzes in the bar and shows in the evening. At every point in the day there were would be a number of planned activities being run, these included bungee jumping, rock-climbing and going on the giant swing. What I loved about Potters was that you could pick which activity to do. Everything was really fun and the desserts at lunch and dinner were delicious. Read more about Potters and watch Robert’s video! Sarah writes: We’ve visited many special places over the years, and tried to draw attention to many of them through our blog. This year’s little gem is the Museum of Norwich at the Bridewell, and it’s well worth a visit, as it’s bright, airy and extremely interesting. It’s also very interactive, making it perfect for kids, as well as being compact enough to ensure that they won’t get bored. The Museum is full of surprises, from diaries and logs of those who were imprisoned there (when it existed in a former incarnation), to a recreation of an old coffee house – with wigs and hats to try on – the story of immigration in the area, and a mock-up of an old pharmacy. It gives the story of the city from 1700 when it was England’s second city after London and goes right up to the present day. We all really enjoyed it. Read more about what to do in Norwich and watch our video! Jess says: Over the summer, our family spent a week in Cornwall, and had a really good time. We spent a lot of time driving around in the car, but there was so much to do, so much history to learn, and so many beautiful sights to see. Particular highlights of mine were walking around St Agnes and Tintagel and admiring the beautiful views, going to the most southernly point in the UK at Land’s End, devouring ice cream and scones in the town of Mousehole, and so much more. We explored Penzance, visited the Eden Project, played squash, and so much more. The whole county is unbelievably picturesque, and it was a perfect mixture of excitement and relaxation. Read our Travelling Times from 2015, 2014, and 2013 and let us know your favourites too! Ah I loved your post about the Dandelion Hideaway. I can picture Robert in the video now. I want to go! 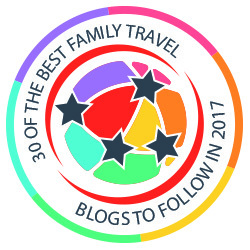 And we really must put Cornwall on our list for 2017….great post! The Dandelion Hideaway was such fun. You’d love it! That’s quite an eclectic collection- I love how many very different family friendly places you’ve found.